Last night the Jefferson City Council heard a proclamation from Mayor Dale Opperman proclaiming the week of May 4th as Municipal Clerk Week. The council also received an update on the specification for the reader board entrance signs that are planned for installation at the entrances of the city. 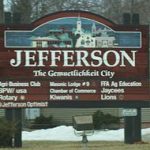 The contract for the signs is planned to be awarded during a May council meeting, and the signs are expected to be built and installed this summer. The council also approved a resolution authorizing the approval of the WMRS Record Disposal Schedule as well as a resolution authorizing the hiring of a part-time civilian reserve officer.